It's been a busy week at Man Blog towers (a single story, damp, outhouse), I've been contacted by all and sundry to test this, and write that. One of them was actually quite a good premise, so I'm writing about it- Football's worst haircuts. Why do footballers have bad haircuts? I think it's a combination of too much money, detachment from reality, and the belief that they are trend setters. When you have an unimaginable amount of money to spend, it's easy to waste it on any number of things (drugs, drink, gambling, whores, cars, tattoos), so why not on a time intensive hair cut. The difference between a bad haircut and a trailblazer. There have been many shonky haircuts in world football, but just because someone stands out, doesn't mean they've got bad hair. Sometimes they're just ahead of the curve. It never really caught on, but those gasps in the crowd were for the sheer audacity of playing football with this barnet. No blog on footballers haircuts would be complete without Carlos Valderrama. The godfather of explosive hairdos, Carlos shone a light that will never go out. 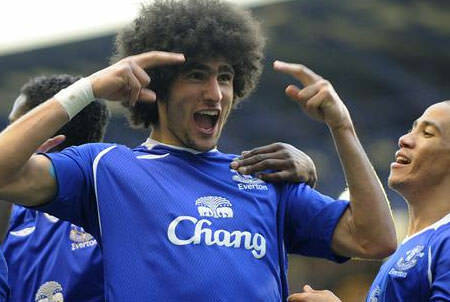 In more recent times we've got Marouane Fellaini. Like a modern Samson, it's clear his footballing prowess flows from his tightly woven locks. Let's hope some page 3 girl called Delilah doesn't convince him to cut it. In my opinion there has only been one truly horrendous haircut in football, and it's one for the ages. Like an economic meltdown, or a dodgy kebab, it repeats itself at regular intervals. It is the 'power mullet'. This signalled the start of my dislike for Carrick. It became clear he didn't want to get stuck in to Championship football and this haircut was his form of protest. However you don't need to take my word for it. You can actually have a vote as to what you think is the worst haircut in world football. I've gone for Waddle.